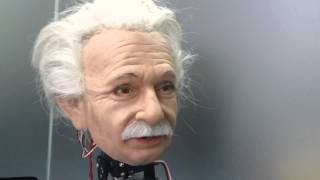 Work on the ROS/Blender robotics control pipeline has culminated in the integration of the system with the tiny robotic Einstein head that had been living at Polytechnic University under the watchful eye of the OpenCog group. Back at Hanson Robotics, tiny Einstein was mercilessly ripped apart and his head attached to an absurdly long robot snake neck apparatus that mimics the configuration of the upcoming “Dmitroid” robot system. Once suitably mutated, tiny Einstein was able to make a few statements and even sing a couple of tunes. Take a sneak peek into the sophisticated engineering processes underway here at the Hanson Robotics Lab in sunny Hong Kong.